Heading to the Amalfi Coast and looking for the best things to do in Positano or wondering what to do in Amalfi Coast? In the off chance that you are not tired of hearing about my undying love for Positano Italy, I’m back for the latest edition of 8 Things! Because I find those “100 things to do in XYZ” posts to be terribly unhelpful, I started this series as a way to help y’all narrow down your likely long list of things to do in some of my favorite places. Because you want a helpful Positano travel guide not just a list of everything you could do there, right?! Right. 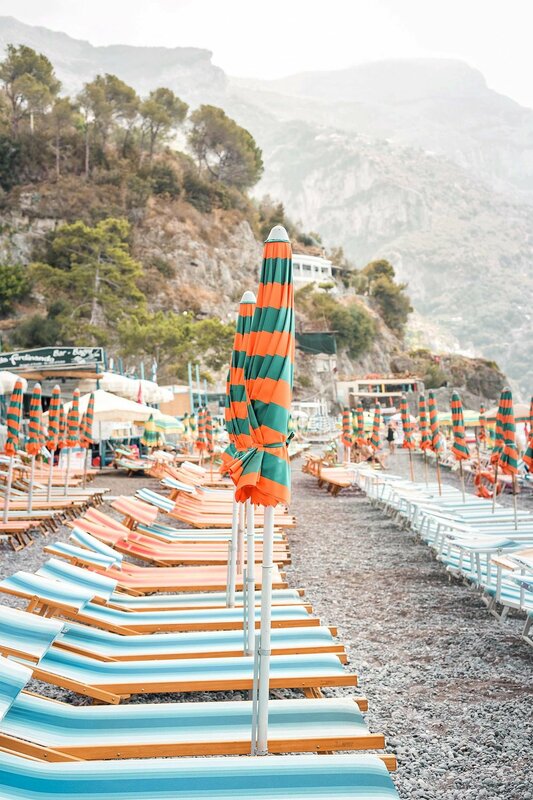 FOR ALL OF THE NECESSARY POSITANO DEETS LIKE WHERE TO STAY, HOW TO GET THERE, AND MORE, SEE: EVERYTHING YOU NEED TO KNOW ABOUT VISITING POSITANO! FOR A DETAILED GUIDE ON HOW TO GET THERE, SEE HOW TO GET TO POSITANO ON ITALY’S AMALFI COAST. Before we get into the best things to do in Positano, let’s talk about planning tools! As a full time traveler with a LOT of experience planning trips, I have a handful of sites and tools that I cannot live without. They save me money, time, and frustration - all of which are very important for me and should be to you, too. For hotels I always use HotelsCombined, as you will notice in my specific recommendations below. I love them because they compare all of the top travel sites in one spot - with no booking fee and no markup. Best price guarenteed! Click here to search HotelsCombined. To get from city to city while in Europe, I usually either fly or take a train. For train travel I recommend using Rail Europe, the #1 distributor for European train tickets and rail passes. I like that you can create an account with them which helps keep all of your tickets and info in one central location. Click here to search Rail Europe. To get around while in city, I recommend walking, using public transit, or Uber if it's available. In many places, like Lisbon for example, Uber is dirt cheap. If you are new to Uber, use code "kbae3" to get your first ride for free. You can also use it on Uber Eats! Want to stay connected while abroad? I recommend renting a pocket-sized personal WiFi hotspot from Tep! Click here to see the latest prices. COMFORTABLE SHOES. You will likely (hopefully) be doing a lot of walking so this is very important! My very favorite are M. Gemi’s white leather sneakers. I literally never travel anywhere without them. Click here to see latest prices. SUNDRESSES. If there is one thing that screams Positano to me, it is sundresses! Click here for my favorite sundresses for Italy. I also shop for them here, here, and here. SUNGLASSES. Of course! Three timeless styles I’ve been wearing non-stop: click here for my favorite Quay aviators (I have numerous pairs), click here for my round Ray-Bans, and click here for my all time favorite black on black Ray-Bans that are often hard to track down because they sell out consistently. BRIGHT LIPSTICK. Because you won’t want to spend time on makeup, and you’ll probably have a bit tan depending on when you go, so a bright lip is the perfect way to spice up your nighttime look! Click here for the one I've been loving from Sephora (especially because it’s called “First Class” and it seems like good upgrade karma, haha). CONVERTER ADAPTER. This one is universal and works no matter where you’re going so it’s a must. When going to the EU I also bring along this very inexpensive 6 pack so that I have extras. So much to charge these days! Need other recommendations? Click here to see my list of 20 must have travel products from Amazon Prime. STYLISH CAMERA BAG… if you are bringing a camera! You can’t go to Italy with anything that isn’t chic ;) I usually bring GATTA’s Christie camera backpack (named after me) because it’s hands free, has a zipper AND a buttoned flap, and fully protects my camera yet is so cute no one will ever know it’s a camera bag. Click here to see the latest prices. Want to see more options? Click here for the most stylish camera bags for women! BLACK PASHMINA. A total lifesaver! It folds up small so you are able to easily throw it in any bag and it weighs basically nothing. However, because of the material it is capable of keeping you surprisingly warm in situations where you have mistakenly underestimated the weather. You can wear it as a scarf, wrap it around your body like a shawl, use it as a blanket on cold planes or trains, etc. - it serves so many purposes. I recommend a black one because black goes with everything and if it gets dirty along the way it will be way less noticeable. Pro tip: if you’re only bringing a small cross body bag with room for your wallet, tie it to the strap! Click here for an inexpensive and highly recommended option. LEATHER TOTE. I never, ever, ever travel without my Cuyana Leather Zipper Tote. It holds so much yet never feels as heavy as other bags! Click here to check it out. Wanna know my organizational tricks? Click here for how to organize your carry-on. REUSABLE WATER BOTTLE. I always pack this but it's especially handy in Italy because there are so many fountains you can fill up in. Hydro Flask is the best because it keeps your drink cold (or warm). So worth the investment. Click here to see the latest prices. For a full list of Italy packing recommendations, click here for what to pack for Italy! I very highly recommend staying at Hotel Poseidon or Dimora del Podesta. Click here to see the latest prices for Hotel Poseidon and here to see the latest prices for Dimora del Podesta. Want more information about why I love those hotels + additional accommodation recommendations? Click here for where to stay on the Amalfi Coast - the best villas, hotels, and Airbnbs! Click here to search all Positano hotels. PS. Don’t have the time to plan your Positano itinerary? 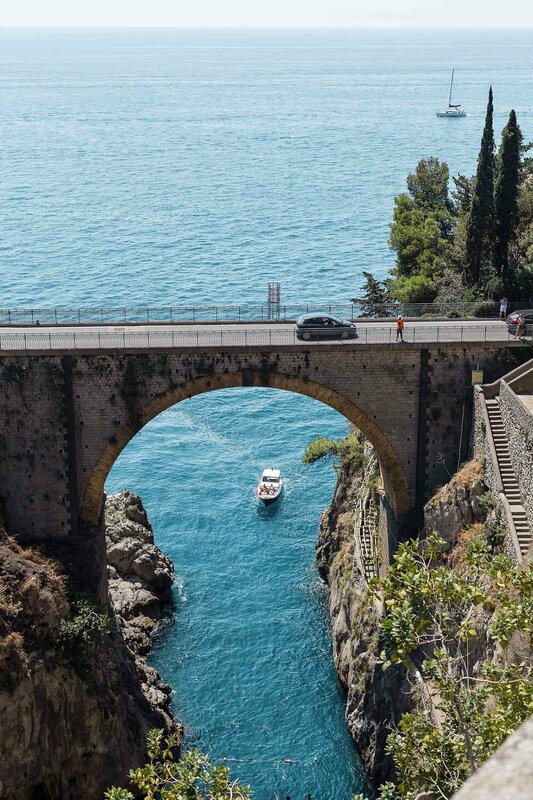 Click here for the best Amalfi Coast itinerary. 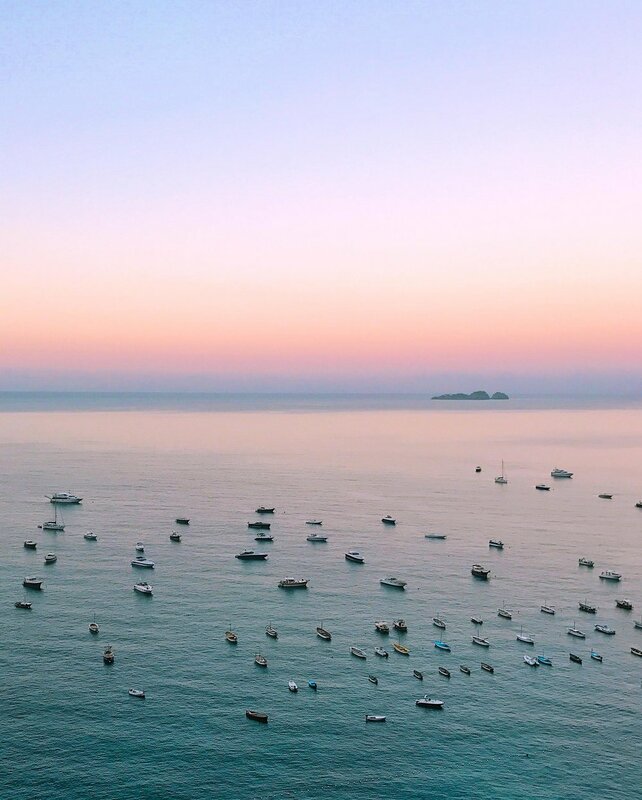 Also, subscribe below to get our free downloadable guide and we’ll also send you some step-by-step help to plan the Amalfi Coast trip of your dreams! I very highly recommend staying in Positano while visiting the Amalfi Coast, but also recommend you spend some time exploring the other towns during your trip! Because one of the best things to do in Amalfi Coast is to actually see the Amalfi Coast. The absolute best way to do so is via scooter, of course. It is one of the most magical Positano activities. There is nothing like zipping around the world’s most beautiful coastline without windows, a car frame, or anything else blocking your view. Most importantly, if you are interested in pictures of Positano Italy and the surrounding towns this is the only way to go. The roads are very narrow and you cannot just pull over to take a bunch of photos. If you did that, you’d block the entire road. Since scooters are much smaller you can pull over anywhere you want, as often as you want, for as long as you want! You can even squeeze around cars to avoid traffic if you are comfortable enough. If a scooter ride is not for you, you can also do this via vintage Fiat. Click here to see the latest prices. Speaking of photos, do you have a chic camera bag that doesn’t look like a camera bag? Click here for the most stylish camera bags for women. The day I spent riding around the Amalfi Coast was truly one of the best days of my life and one I will remember forever. It is my highest recommendation in towns of Amalfi Coast things to do. Here is my photo recap of that day to hopefully inspire you to do this, and here is a guide to all of the Amalfi Coast towns I recommend you visit! When I ask myself what to do in Positano today, I often find myself here. Hotel Poseidon is a stunning, family-run, 4-star hotel in the heart of town and one of the best places to stay in Positano. It’s not just one of the best Positano hotels but it also happens to be one of my very favorite places :) If you are looking for the perfect Positano hotel to stay at, this is it. It’s very popular and tends to book up quickly, so make sure to reserve it as early as possible if you are interested. If you aren’t able to stay here, I still recommend visiting it, as it is one of my personal favorite things to do in Positano Italy! The view from the hotel’s terrace is one of the most amazing views in Positano. 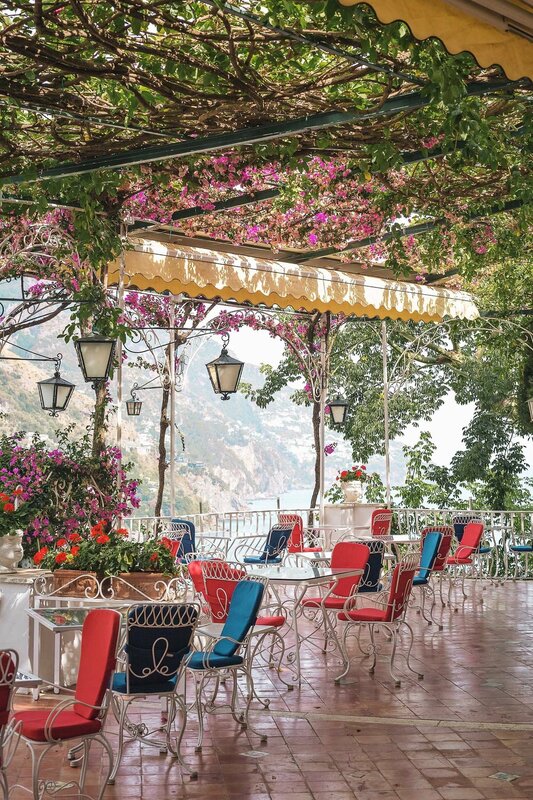 On the terrace is their wonderful Positano restaurant, Il Tridente, serving breakfast, lunch, and dinner using only local ingredients. It’s also the most perfect place to grab a cocktail and watch the sunset. In addition to Il Tridente, the terrace is also home to Hotel Poseidon’s pool. If you’re looking for Positano hotels with pool, need to escape the crowds or need a beach alternative, this is your spot! Access is free for hotel guests but as a non-guest you can pay a fee to access. I did this not once but twice while in town and it was worth every penny! When it comes to Positano Italy hotels - you really cannot beat Hotel Poseidon. If you are looking for a more inexpensive place to stay, check out Dimora del Podesta. I stayed there during my first visit to Positano and it is pure magic - I cannot recommend it enough. It too is ran by the sweetest local family and every single person I’ve sent (and there have been MANY) has loved it just as much as I do. Click here to see the latest prices. Want additional accommodation recommendations and more of the best hotels in Positano? Click here for where to stay on the Amalfi Coast - the best villas, hotels, and Airbnbs! Of all the Positano Italy things to do, this is the best nightlife option. This is especially for you if you are looking for unique things to do in the Amalfi Coast! I don’t know what it is exactly that makes me love this place despite not being a club person, but you’ll catch me here until it closes down at 4am most nights I am in town. It is one of the best Positano things to do. Don’t miss it if you’re looking to have a wild Positano holidays and make sure not to show up before 1am or you’ll be the only one there, literally! Above photos via their Facebook page. Many people don’t know this, but the main Positano beach is not the only beach. The beach you see in everyone’s photos and the one you arrive at if you come by ferry, Marina Grande, can become a bit of a tourist nightmare depending on time of year. A short walk away is a much lesser known beach, Fornillo Beach, a Positano Italy beach where locals and wanna-be locals like myself hang out instead. It’s a bit smaller but still easy to get a spot at even in July during peak tourist season. The beach is lined with many restaurants and beach bars like Pupetto so you can grab a meal or drink between lounge sessions. I always spend at least one full day here while visiting if the Positano temperature is warm enough! 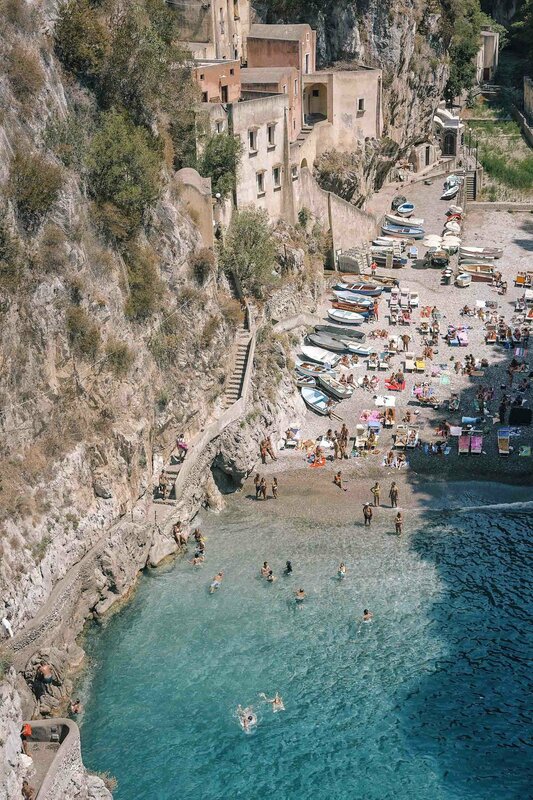 Definitely one of the top things to do in Positano and one of the best beaches in Positano. Since I always visit during summer, I cannot tell you how many people say to me “isn’t it filled with tourists? !” every time I go. They’re even more surprised when I answer “no”. I somehow find myself in Positano during the month of July which is the most touristy time of year for most places. Cinque Terre in July? Unbearable. Amalfi in July? No thanks. But Positano? It’s fine. Why? Probably because I don’t stick around the center of town. If you look at a Positano map, you’ll see the main beach on the bottom right. Everything north of there gets a bit touristy, but if you go over to the left (see above map) everything is much less crowded. It’s also where many of the best Positano Italy restaurants are, Saraceno d’Oro (get the pizza), Il Fornillo, and Da Vincenzo Positano, and some of my favorite Positano shopping. It tends to be easier to get into spots over there, plus I find it to be much more enjoyable in general, so don’t miss it. You’d be doing yourself a huge disservice to visit and not get out of the tourist hotspot! I’d do this no matter the time of year, but if you are looking for things to do in Positano in July to escape the crowds, this is definitely for you! This area is also home to Dimora del Podesta, one of the best hotels in Positano Italy. Click here for more information. Side note: I also always stay in this area preferably at Dimora del Podesta if they have availability. Click here to see the latest prices. You absolutely cannot visit the Amalfi Coast without seeing it from the water at least once. Most would also argue that you can’t visit without stopping by Capri, so let’s kill two birds with one stone for this item. La Fontelina is a jaw-dropping, iconic beach club located on the island of Capri. If you’re a fan of Gray Malin, you will recognize this spot from his La Dolce Vita series. While I happen to have the unpopular opinion that the island in general is nothing to write home about (at least not in July), La Fontelina is a different story. It’s an absolute dream. Click here to see the latest prices and reserve your spot. The Amalfi Coast is known for it's handmade sandals. Positano is filled with dozens of stores that will make you sandals by hand while you wait, fit perfectly to your foot! You simply pick the style, the color, the size, and within around 15 minutes you have your own pair of fully custom sandals. I had mine made during a power outage (very impressive!) and still love them almost 3 years later. Want more? Click here for everything you need to know about visiting Positano (including more ideas of things to do) and here for the best Amalfi Coast itinerary!